Noah Hawley's incredible X-Men TV show succeeds because it honors what great comics have always done. When Legion began airing on FX in February, critics immediately called it a “new kind of superhero story”, ignoring showrunner Noah Hawley’s obvious reverence for comic and art history. The truth is, Legion turned out to be a fantastic show because it told a very old story, using the kind of art that has kept superhero comics alive and vibrant for decades. The Modern Age of comics, which analysts consider an era beginning with Frank Miller’s The Dark Knight Returns and Alan Moore’s Watchmen, created narrative scaffolding for eccentric superhero stories, which Legion borrows from directly. Without these mind-bending comics from the Modern Age, a superhero story like FX’s Legion simply wouldn’t exist. Setting aside the obvious front-runners, including Dark Knight Returns, Watchmen, Charles Burns’s Black Hole, and Neil Gaiman’s Sandman, there are still a ton of trippy, psychological horror comics worth checking out. Joker has long been a favorite protagonist for comics writers who want to explore psychological themes in their work, but Grant Morrison’s take on Batman’s nemesis is the definitive one. Morrison is famed for creating dark, twisting narratives that almost seem to punish the reader, so his deep dive into the minds of Batman villains confined to DC’s most famous psychiatric hospital is unforgettable. In Legion, David Haller hates himself because he compounds his mutant powers with the influence of the Shadow King, assuming that he’s a paranoid schizophrenic. In Alan Moore’s landmark take on DC’s Swamp Thing, the intellectual and nihilistic monster struggles against the role society has put him in. 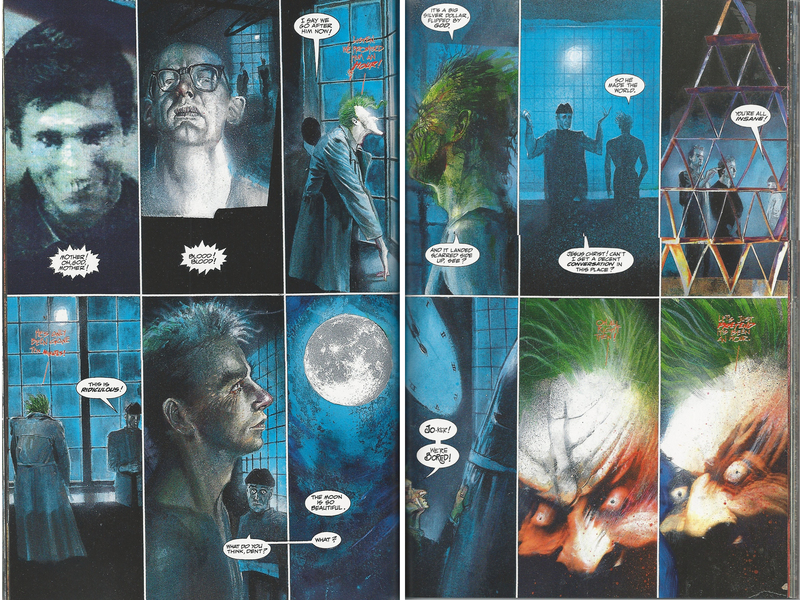 When Alan Moore took over the comic in 1998, he re-envisioned the character’s origin, making him “a plant who tries to be a man.” He’s plagued with multiple personalities and desires, much like Legion, and the comic depicts these through a lyrical, trippy visual language, which Noah Hawley seems to enjoy, too. In Image’s seminal horror series, things exist purely because someone believes in them. 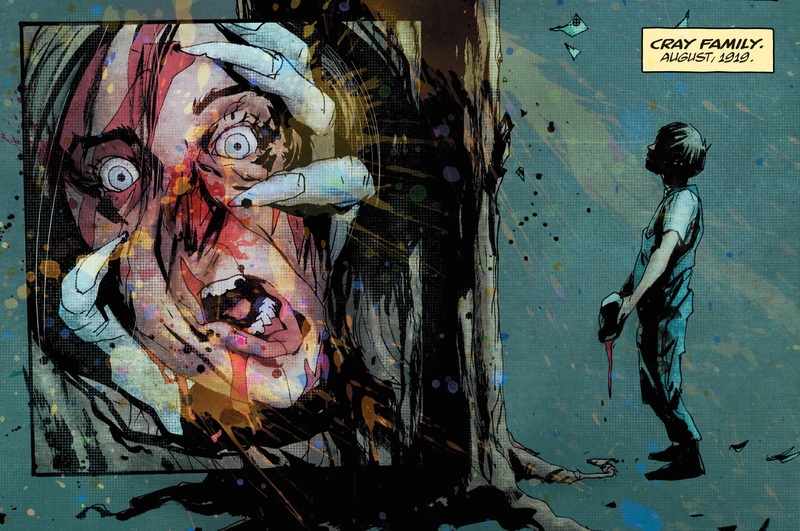 David Haller in Legion is able to manifest threats to his own psyche (and these threats can actually hurt his friends physically), and that confusing logic is alive in Wytches as well. In Legion, the Shadow King tries to tell Syd, David’s girlfriend, that extracting him from David’s mind will plunge his powerful brain into a chaotic state. “Have you ever tried to unmake soup,” he asks, grinning. Legion is far from the first artistic project to depict a superhero’s cracked and bleeding psyche; Alex Kot’s take on the brainwashed and traumatized Bucky Barnes remains one of the most confounding and gorgeous looks at insanity in modern comics, and there are echoes of the book’s most arresting panels in Legion. Gail Simone’s hallucinatory horror comic for Vertigo feels like an especially disturbing Black Mirror episode in which a cult leader uses a psychic chamber to control and frighten her underlings. The comic uses similar visual cues to the ones seen in Legion in order to communicate which situations are “real” as opposed to imagined or cultivated by the book’s central villain. Nameless, the most horrifying comic of 2015, is another of Grant Morrison’s foray into psychological terror, though this story leans more toward fantasy than superhero fiction. A huge asteroid hurtles toward earth, carrying with it one of the ancient gods of creation, which all humans still remember in their biology, though they can’t recall exactly what they’re afraid of. As Xiabalba approaches our planet, it begins transmitting mind-meltingly scary images into the minds of humankind. Watching them unfold on the page is a harrowing experience. Legion is far more stylistic and precious than it is horrific, and the way it tells David’s story in charming, almost geometric, shapes and patterns recalls Chris Ware’s masterful work. In Jimmy Corrigan, no space on the page is left unused, and its hero’s mind is visualized using interconnected tiny drawings and cute shortcuts, recalling some of Legion’s most pleasant imagery.